Find out how much money you really need and where to find it. This book reviews the main ways in which to finance your new business. The Introduction discusses different legal structures for your business and the choice between debt and equity. You will be taken on a tour of financing during different stages of your business growth, all the way from obtaining support from relatives and friends to informal investors or angels. Take a look at the venture capital industry and what it can offer you. Obtain hints on negotiating with venture capitalists, the due diligence process, term sheets and the legal agreement. Another chapter tells you about the different types of loans which banks offer and how to prepare your business before you apply for a loan. You will also discover how your banker will evaluate your loan application. See how you can use leasing as a type of off-balance sheet financing. Then take a look at factoring as a method of financing using your accounts receivable. Learn how to sell shares to the public through an Initial Public Offering (IPO) and what’s involved in Employee Share Ownership Plans (ESOPs). Learn how to determine how much money you really need and why your business plan is so important when you are looking for financing. 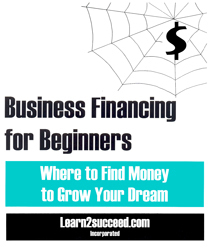 Business Financing for Beginners: Where to Find Money to Grow Your Dream by: Learn2succeed.com Incorporated: softcover; 146 pages; ISBN: 978-1-55270-355-7; published in 2009; $24.95.